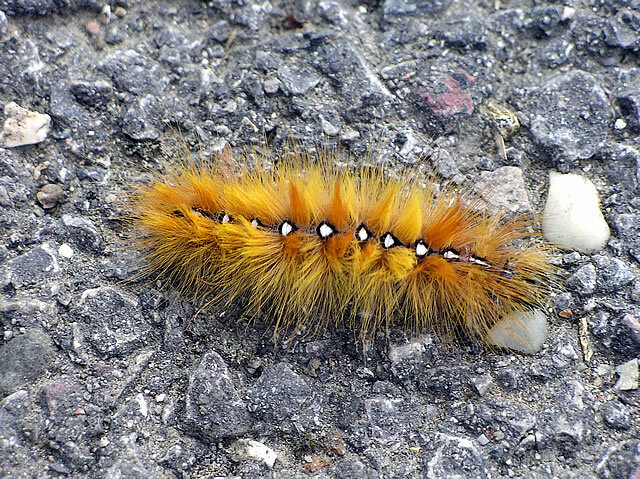 Vapourer moth caterpillar - why are you wearing those ridiculous shaving brushes? 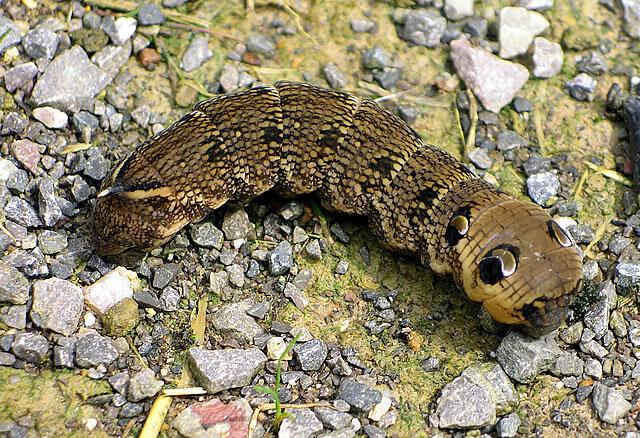 Elephant hawk moth caterpillar - Oops! 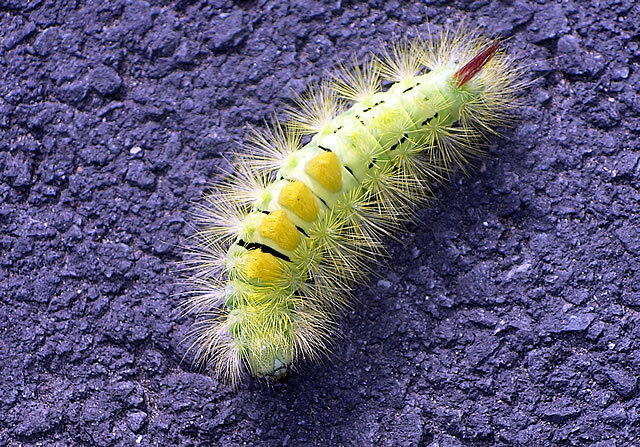 Pale tussock moth caterpillar - dig that dude! 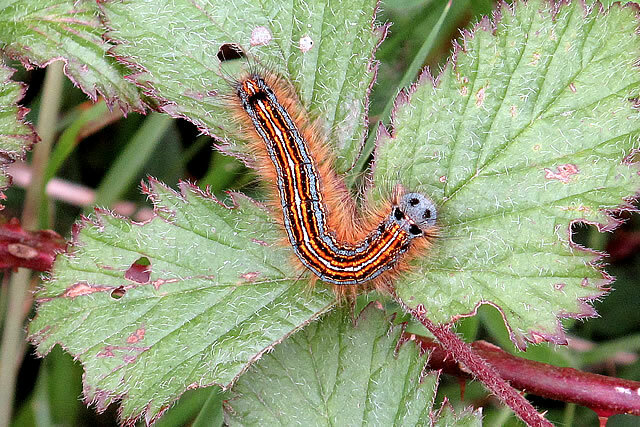 Caterpillars (the larvae of moths and butterflies) come in the most wacky guises, unlikely shapes and colours. Three of the images show caterpillars of the Vapourer, the Pale Tussock and Elephant Hawk moths. These are all relatively common moth species, which might well live in your back garden, but how often do you come across them at any stage of their lifecycle? 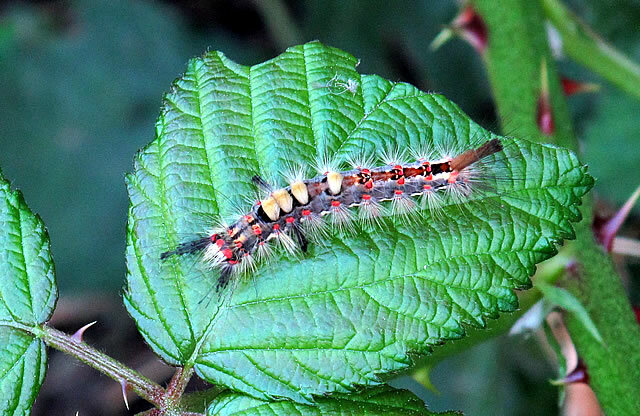 The Vapourer and Pale Tussock caterpillars look for all the world like punk rockers plucked from the King's Road in the late 1970s. The Elephant Hawk caterpillar is far more effectively camouflaged and despite its large size is much harder to spot. So why have these different species evolved in such drastically different ways and how do they stay one step ahead of their predators? These creatures may fall victim to any one of a large variety of predators - from birds, reptiles and small mammals to spiders, wasps, ichneumon flies, ants and lacewings. Camouflage is one of the most effective and obvious techniques to avoid detection, but bear in mind that many of the above-mentioned creepies are able to locate their victims by pheromone smell detection, so camouflage alone is not an adequate defence. This begins to explain why the first two larvae are ‘dressed' so eccentrically as they clearly use a different method of defence. Insects like ichneumon flies and wasps inject their eggs into their prey, which after hatching, eat their victims alive from inside - nice! Spiders inject venom into their victims to paralyse them. What a choice! If you are a caterpillar with a very dense growth of hair it will be much harder for a predator to penetrate it and attack you. Another trick up your sleeve (or fur coat) is to have glands which secrete toxins on to your hairy exterior that will cause severe irritation to anyone who tries to mess with you. Some of these toxins can even cause acute allergic reactions in humans. Alternatively it helps to be highly coloured as this is a universal sign in nature that you are extremely unpalatable, although having said that you can double-bluff your prey by being brightly coloured and not poisonous! Being very hairy and having strange ‘shaving brush' like structures sticking up in the middle of your back are helpful to you if you happen to be casting a shadow in strong sun light thus revealing your profile for all to see. Your shadow will be greatly defused by your hairiness and your shaving brushes will probably confuse your prey sufficiently that he won't suspect that you are his lunch at all! If these tactics seem slightly eccentric, how about mimicking a piece of bird poo, as the larva of the Comma butterfly does! The Elephant Hawk caterpillar is able to inflate its front end which has realistic eye markings, giving it the appearance of a scary serpent, inflicting the need for an immediate change of underpants on any unsuspecting, hungry bird. The more I study insects the more I am inspired by the innate genius of natural selection and its infinite adaptations within the insect kingdom. Just stand still and look closely at a hedgerow in spring or summer (preferably one that hasn't been ‘nuked' with herbicide and or pesticide.) It is a hive of activity, attracting all sorts of creatures: bees, wasps, flies, beetles, bugs, grasshoppers and crickets all going about their business of basking, feeding, nectar-gathering, hunting, mating and establishing or defending territory. Some creatures even go to the trouble of pretending to be somebody else: like a fly mimicking a wasp as a method of self-defence. The more you look, the more you will see!